“Ninety-nine percent of us believe we live in the human age. We are still in the epoch of insects and trying to attain the human age in the fight against insects” [Howard (4)]. Chemical, physical and biological methods are used for pest control. Example 2: After the 2nd World War, E 605 saved the rice harvests in Japan and saved many Japanese from starvation. 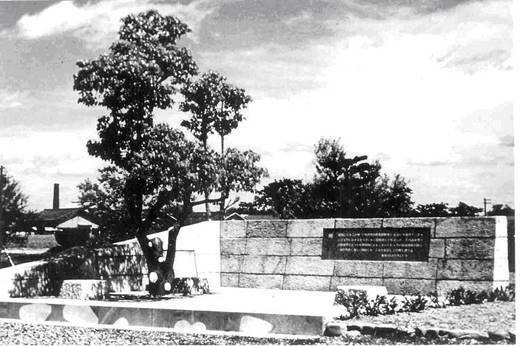 This is why a monument was erected in Japan for E 605: see photograph on the page after next. There were approx 2.5 mio cases of malaria in Ceylon (now Sri Lanka) in 1947-49, before the use of DDT, in 1962-63 there were only 100 meaning the malaria disease was completely defeated then! After the complete ban of synthetic insecticides there were in 1969 already over 2 mio new malaria cases in Ceylon: Table 1. The author warned over and over again in time against a complete ban of the mentiond insecticides in his lectures in the fifties, and recommended a middle course under the premise and the target “less chemical pest control”. Publications with overdone interpretations like the book “Silent spring” by the nature protection writer Rachel Carson in 1962 and unwise ill-considered talking bigs of Green people are responsible for many millions of malaria cases and deaths between 1969 and now; in Africa for instance more than 1 mio children in an age under 5 years died annually according to recent News Paper reports (15). The aforementioned lady propagated an absolute prohibition of DDT (3). The author delivered to Ms Carson on her requests in 1949 and 1951/52 comprehensive material about synthetic insecticides (5-8, 14) and gave in these papers also early criticism of any improper and unneccesary use and their consequences (9-13). Unfortunately the aforementionated writer did not quote any of these papers (listed in SPECIAL PART A) in her 1962-book. The author drew Ms Rachel Carson’s attention to her unprofessional conduct but in view of her poor state of health refrained from taking legal action: Carson case in the SPECIAL PART A). Any responsible scientist who has anything to do with chemical pest control will immediately reflect on the problems linked with the widespread use of chemical toxicants. So from 1948, the author trod other paths with respect to pest control, parallel to his own work on insecticides containing halogens and recommended “ less chemical pest control” meaning: Opposite of widespread use of large quantities of synthetic toxins like halogen and phosphorous compounds. Hardly possible to forgo chemistry completely. «Mit etwa „Gebt uns synthetische Insektizide wie DDT zurück“ hat 2007 der Generaldirektor der Gesundheitsbehörden Ugandas seinen Hilferuf in „Wall Street Journal“ überschrieben: Es hat sich gezeigt, dass sich die Gefahren für Mensch und Umwelt als eher geringfügig herausgestellt haben, obwohl DDT früher mit Flugzeugen zu Tausenden von Tonnen flächendeckend als Insektizid über die Felder ausgebracht wurde – eine Anwendung, die heute nirgendwo zur Debatte steht. Heute ginge es darum, das Insektizid in grossen zeitlichen Abständen und wohldosiert zu sprühen, was die meisten Entwicklungshelfer vor Ort und auch derzeit die afrikanischen Gesundheitspolitiker für das einzig wirksame Mittel gegen Malaria halten» , zitiert nach (15). Under the titel „Critical comments on chemical pest control and ways to reducing it” the author had drawn in his book (2) the attention to the toxicological dangers for humans, animal and plants as well the problems of resistance and discussing the possibility of a negative influence on the food chain; insect – bird, reptil - mammal [1948-50 (9-13)]. The ready solubility of halo compounds in lipoids facilitates accumulation in fat tissues via the food chain, with humans at the end of it; cf. also SPECIAL PART F). Scant notice was given to the phenomenon of resistance at the time and to the consequences it entailed (eg continuous increase in the quantities of insecticides used), irrespective of how much attention was drawn to it in instructions and lectures: SPECIAL PART B) and C). We began to tread new paths in pest control, parallel to the research in hand with chemical agents, presented in PROJ VI-XIII (2), but the time was not ripe for this: the “environmental awareness was not developed enough” as we would say today: SPECIAL PART C). The systematic search (5, 7) for new potent “halo compounds with new spatial distribution of halogenates” under the heading of “halocarbon-based contact insecticides” [(410) in (2)] led the author to the DIENE group insecticides - and one of them, M 410, was considerably more potent than DDT (7, 8, 2). Despite this success, the author – on the basis of discussions with older, more experienced colleagues (Pl 1) – from the beginning did not underestimate the problems entailed in controlling pests with not naturally available chemical agents and, as mentioned above, sought other, less toxic possibilities of pest control. The leading scientists of the institutions named (Pl 1, col 1 and 2) made their widely differing views on CHEMICAL PEST CONTROL known to the author. It is true that they supported him sufficiently, but they were not sparing in their criticism and so influenced, as is detailed in Pl 1, the author’s attitude and – without saying so explicitly – postulated ways that favoured LESS CHEMICAL PEST CONTROL: SPECIAL PART D). This section – with its criticism of synthetic insecticides – should not, however, conclude without laying special emphasis on the significance and necessity of chemical pest control, best done by quoting some statements from competent scientists as mentioned in the introduction to this essay. When human lives are at issue as in the case of malaria, or if people can be saved from starvation and there is no other solution (yet), we should be willing to compromise regarding the use of chemicals. (Wenn es um Menschenleben geht, wie im Falle Malaria, oder wenn man Menschen vor dem Hungertod bewahren kann und es (noch) keine andere Lösung gibt, sollte man hinsichtlich Einsatz von Chemie zu Kompromissen bereit sein). Critical of widespread, purely chemical pest control as practised by Allies and German forces in WW2. Already knew in Oct 44 about Allied use of DDT in Naples (typhus) via Military Intelligence. But aided author’s investigations. In Nov 1949 Ms Rachel Carson turned the first time to the author for advice and requested his books entitled “Kontakt-Insektizide auf Halogenkohlenwasserstoffbasis I and II” (5,6) and for further material regarding alternatives, especially regarding lecture manuscripts. Below is a list of all documents sent by the author to Ms. Carson in 1949 and, at her request, again in 1952 (witnesses: E. Schölzel, H.J. Hein, cand. chem. and Nussa-Schuster, cand. pharm.). None of the publications cited below were ever quoted by Ms. Carson in her book (3). Therefore, it seems all the more important to the author to show how critically and conscientiously experts dealt with synthetic insecticides at the time and what had been published before Ms. Carson wrote her treatise. - Mss of the lectures, entitled “Kontakt-Insektizide der DDT, HCH, DIEN-Gruppe“ (part I) together with “Kritische Anmerkungen zum Thema der chemischen Schädlings-Bekämpfung und Alternativen“ (part II), given from the author on 29 Jan 1948 in BUNA, Schkopau (9), on 11 Febr 1948 in LEUNA, Merseburg (10), and on 14 Mar 1948 im Werk KAUSTIK, Wolfen (11). There was a break between the parts I and II of each lecture. The break was used to bring to an end the experiment, begun 15 mins after the start of the lecture and shown by epidiascope, to poison Oriental cockroaches Blatta orientalis with M 410. The glass test containers were surrounded by deep flowing water to protect the test insects from the heat of the projector lamp [ie so as not to kill them by heat instead of M 410]. As the toxins like M 410 that are used in low concentration act relatively slowly, the effect was clearly visible only after 45 mins. ; cf also comment in ref (10). Mrs Carson was informed about the lectures mentioned below (11-13) through Prof F Herter, Zoology FU, who participated on the “Thuesdays 5 o’clock tea meetings” in the Inst of Mathematics FU of 16 Nov 1950 (11), 22 Febr 1951 (12), and Mar 1951 (13). The author also sent Ms Carson outdated documents with appropriate annotation in which R WIESMANN from the Wädenswiler Research Institute, Switzerland (later Department of Biology at GEIGY Werke) referred to the “harmlessness of GESAROL for bees”, eg that “GESAROL is only toxic if it is sprayed or dusted directly onto bees” [WIESMANN’s 1942 statements, cited at (485b) in (2)], very soon refuted by American work and also by the author. See also SPECIAL PART F). 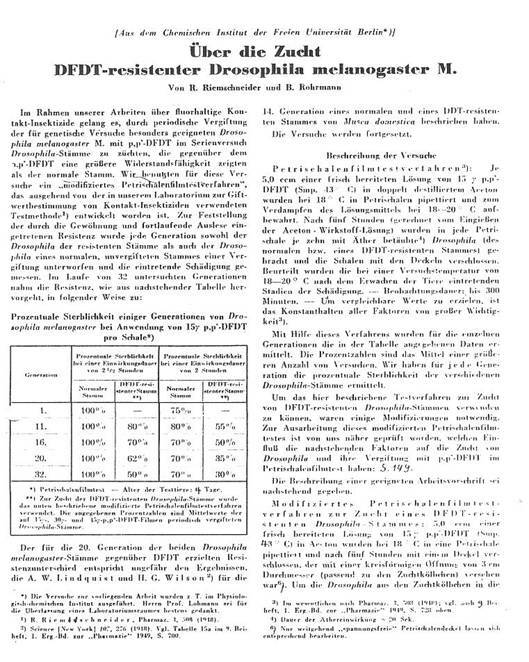 For demonstration purposes, we began to induce DFDT and M 410 resistance in the lab (16a,b): fewer than 20 generations sufficed to obtain a “positive” result for Drosophila melanogaster M.
Während bei Anwendung von M 410 und DFDT Resistenz bereits nach der 10. Generation auftrat, konnten wir mit M 377 auch nach der 50. Generation keine Resistenz beobachten (25). M 377 is a difluorine derivative of M 410, namely the 1,2,4,5,6,7-hexachloro-10,10-difluoro-4,7-dimethyl-4,7,8,9-tetrahydro-hydrindene (first synthesized in 1946) obtained by adding chlorine to the double bond of the adduct from tetrachlorodifluorocyclopentadiene, C5Cl4F2 , and cyclopentadiene (26). Terms like “chemical cudgel” or “environmental impact” played no part in the 40ies and 50ies. However, there were enough impulses and circumstances that pointed in the direction of “less pure chemistry”. Initially, the author’s workplaces got more or less by chance played a part, ie institutions where “biological chemistry dominated over pure chemistry”. 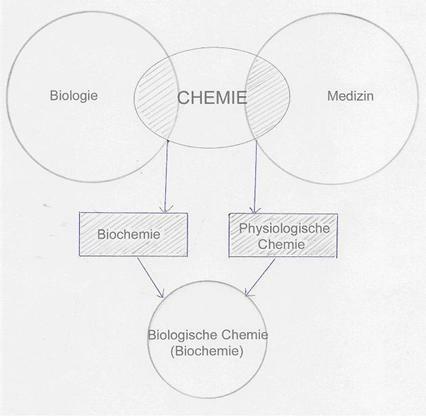 In all the scientific institutions listed in Pl 1, the connection between chemistry and biology or medicine were “served” to the author, so that in 1947 he already used the term BIOLOGICAL CHEMISTRY instead of BIOCHEMISTRY for these “combinations” in his lectures (teaching assignments) for students of chemistry, medicine and biology: Plate 5 in SPECIAL PART E) - Xenobiotica which include synthetic insecticides also belong to this field. She stated that “… in Africa even today harvests without the use of so-called ‘chemical cudgels’ would in many cases not be possible at all – ie many people would have to starve to death. There is no comparison to European conditions”. Further discussion see (17). A complete ban of the synthetic insecticides was not pursued then. 1. Sexual sterilisation of insects (pupae) by physical influences or chemical sterilizers (18), both postulated by Knipling in the thirties. E F Knipling had already postulated in the 30s that it was best “if one would leave insects to control themselves”, eg by making it impossible for them to procreate: consideration of sexual sterilization or the use of synthetic or natural sterilizing agents. Instead of using direct-action toxins, use of compounds that are structurally similar to those found naturally and after incorporation in the organism disrupt or destroy the intermediary metabolism, eg peptides (L)x–D–( (L)x [x = 1,2 etc, channelling in of D-amino acids], amino acid homologues or altered nucleic acid bases, the latter to be considered as the sexual sterilizers: Plate 2 concerning the “attemps to negatively influence the metabolism of insects by placement of unphysiological compounds (in their food) structurally similar to those occurring naturally” (19a-e). Unphysiological compounds and compound types that have been tested for effect on metabolic processes in insects. Experiments with I on Drosophila melanogaster M. and also on microorganisms led to interesting results. R Riemschneider: Rereading 66 years of chemistry “Nachlese – 66 Jahre Chemie”, there under Project XXI. More information concerning this subject in Plate 4 (next page). For a number of years, experiments have been carried out in our laboratories to develop substances for pest control that interfere with the metabolism and / or succession of generations of insects, without however the toxic and other side-effects of the more common insecticides. Our aim is thus not insecticides in the proper sense, but rather compounds that are absorbed by insect metabolisms as substitutes for physiologically active compounds due to their constitutional similarity and impair procreation or other functions of the organism. Applying them could represent an "evironmentally friendly" method of control. To these compounds which effect the metabolism we count eg a) p-X-substituted phenylanan-ines (X = F, CH3) that are incorporated into the body's own proteins and / or destroy enzymes b) unphysiological acids of the citric-acid cycle, like fluoromalic acid, that can block enzymes, further c) modified bases like eg haloorotic acid, S-alkyl-thio-fluororotic acid ester. The choice of unphysiological compounds to interfere with the metabolism, can generally be made from the following points of view: they must be constitutionally similar to the naturally occurring, physiologically active compounds and not deviate too much with respect to molecular weight and size of molecule. A certain competition between the unphysiologically and physiologically active substances plays a part, eg in that the latter can be displaced during the formation of an inactive molecule or incorporation in a nucleic acid chain or in a larger protein molecule. Halogen-free compounds, eg CH3 derivatives are preferable as they themselves, and their degradation products too, are not expected to be toxic, eg methylated glutamic acid, homolysine and isolysine (27). Substances that act as enzyme toxins or inhibitors on the enzymes of the insects own bodies, but have no effect on the enzymes of warm-blooded animals are to be mentioned in this context. The relationship between the quantities of metabolism inhibitor and foodstuff also needs to be taken into consideration. The small amount of inhibitor taken in with the food that is injurious for an insect body will in general cause no damage to a larger warm-blooded organism. The systematic application of the active neem tree agents in the soil can protect plants against pests (Pflugfelder, Riemschneider, Jena, from 1946). The author was able to obtain a continuous supply of neem tree seeds, leaves and bark from the Patel and Azhar families from 1947 [arranged by Prof Dr Butanandt, who wrote his dissertation about rotenone in Göttingen and was very interested in the author working on the chemistry and applications of active substances from the neem tree] and also from Prof R Wasicky of São Paulo, Brazil from 1949. Mahmud, the scion of the Azhar family, later worked (1971-90) in the Institute of Biochemistry headed by the author at the Free University of Berlin. Neem tree leaves have a pleasant smell, unlike the seeds (which is of interest for cosmetics according to own experiences). We placed neem tree leaves under legumes and cereals to protect them in storage. Neem tree bark has antiseptic properties and is probably unsuited for pest control (It is used for dental care in Asia). Neem tree seeds are harvested when they are yellowy-green and immediately dried, then stored in thin layers in a ventilated place, protected from sun and rain. The dried seeds are milled for use in pest control. On the subject of the neem tree’s repellent factors for chewing insects: We will refrain from detailing our extensive experiments over several years (1970-75) to isolate a pure Azadirachta repellent factor for chewing insects (20c): Pure C32H40O11, known as Azadirachtanine, from mp 225-226°C is described. Our purest preparation isolated had the empirical formula C28-30H35-42O9-12, mp 223-225°C (20c). The Tetrahedron Letter 26 6435, 1985 confirms our results (20c) progressing in an excellent way. Here thanks once again to Ms M Fereira, Mr W Pollack as well as Dipl-Chems H-J Hein, M M Souza and M Azhar for their untiring work in this project too. Our experimental results are still secreted by industry`s request: In 1994, we resumed our experiments from 1948-58, external funding. It was well known that anopheles prefer nectar- and sugar-containing sources to satisfy their energy requirements rather than human blood; according to measurements, the ratio is approx. (10 - 15) : (1). This habit could be exploited by providing bait through covering synthetic plants such as flowers with foils containing sugar with toxins acting against plasmodia. The pathogens absorbed would be killed after the mosquitoes have ingested the active substance. Preliminary experiments have shown that it is possible to use foil material which is impossible to penetrate for other insects; cf. PROJ XVIII: Permeation experiments (secreted). Mosquitoes free of plasmodia no longer cause damage when they sting. Results: Spraying molasse solutions with addition of Coca-Cola, later for larger experiments with H3PO4, helped to grow an ant population which then eliminated the crop. Repetition experiments confirmed the results. The number of malaria deaths is rising again worldwide. Deciphering the Anopheles mosquitoes’ DNA code in 2002 has brought no medical progress to date. Treatment of malaria is at present largely based on the drug Artemisinin, isolated from the annual mugwort (Beifuß) [Artemesia annua: active ingredient in traditional Chinese medicine for 1500 years; today produced in China under the name “Kuratim” in co-operation with a Swiss company]. A factory was built in Narobi in 2004 with aid from China’s government and help from Chinese scientists to produce the microorganism BTI for controlling Anopheles larvae. As is known, a toxin produced by BTI kills the larvae but not the mosquitoes. One problem in controlling malaria with BTI is using it at the right strength, that must be determined in preliminary field tests. Further details and other endeavours to solve the malaria problems cannot be taken into consideration here because it would be beyond the scope of this frame. In an interview given on January 23, 1968, to the Berlin broadcasting station RIAS for the programme "Unser wissenschaftliches Tagebuch", the author explained the significance of the subject BIOCHEMISTRY, better BIOLOGICAL CHEMISTRY and its delimitation against other subjects: Pl 5. „Unter Biochemie – besser Biologische Chemie – verstehen wir die Lehre der stofflichen Veränderungen in der belebten Natur. Beispiele: Photosynthese, alkoholische Gärungen, Biosynthese der Eiweißkörper und andere, d.h. beim Studium der Biochemie erfahren wir, wie das Leben chemisch vor sich geht. Wir ermitteln die Bestandteile von tierischen und pflanzlichen Organismen, wir beschäftigen uns mit der Frage, wie diese Bestandteile gebildet werden, wie abgebaut werden, welche Funktionen sie tragen, wir betrachten ferner das Zusammenspiel dieser Stoffe im intermediären Stoffwechsel. This scheme was developed by the author in 1952 after a discussion with Prof. Dr. Richard Kuhn. It makes the subject "Biological Chemistry" (called "Biochemistry" for a long time) equivalent to the recognised subjects "Inorganic", "Organic", "Physical" and "Technical Chemistry". It also forms the basis for the interview recorded by reporter Friedrich Marsfeld at the Berlin broadcasting station RIAS on January 23, 1968, for the programme "Unser wissenschaftliches Tagebuch" (Our scientific diary). See the text of the RIAS interview. concerning DDT and analogues are given 1949 in the author’s monography (6) : Reports about effects on skin (DDT, dissolved and not dissolved), on eyes, on respiration system, on digestive system (acut, chronically; self-trials, accidents). - Estimated DL50 man for DDT: 150-600mg pro kg (28). Amongst other things the author explained: The relative nontoxicity of DDT-preparations for mammals is very much depending on its rather negligible - resorption impeding - water solubility; therefore it would be difficult to commit suicide with DDT powder, except DDT is taken in organic solvents which are mostly more dangerous than DDT itself. - that the decomposition of the xenobiotics DDT (DDD) in the body goes via HCl splitting to “urine capable” dichlorodiphenyl acetic acid. Today we know that a suitable way of application and a well calculated dosage of synthetic insecticides - directed by specialists – is helpful to avoid health damages. Durch den konsequenten Einsatz von DDT (bzw.DDD), d.h. durch die direkte Vernichtung der die Malaria übertragenden Insekten war diese Krankheit in den 50er Jahren praktisch ausgerottet worden. Dank solcher Veröffentlichungen wie „Silent Spring“ und auf Grund übertriebener Aktionen der „Grünen“ sind in manchen Ländern die synthetischen Insektizide immer mehr in Verruf geraten, es kam sogar zum 100%igen DDT-Verbot; dies hat erneut zum Ausbruch der Malaria geführt - mit der Folge von Millionen Opfern (von mehr als 40 000 000 in den Jahren 1969 bis heute). 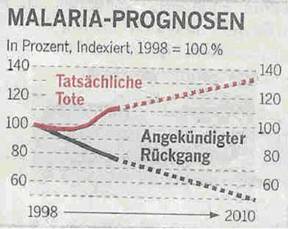 Man wird fragen dürfen, ob es gerechtfertigt war, angesichts solcher Zahlen von Malaria-Opfern – und darunter Millionen von Toten – ein völliges DDT-Verbot auszusprechen und aufrechtzuerhalten. Ob diejenigen noch ruhig schlafen können, die das zu verantworten haben? Verfasser hatte in seinen Publikationen und Vorträgen immer wieder „recommended a middle course under the premise and target: Less Chemical Pest Control – looking for other ways for controlling pests” (9-13, 1). Zur 4. Auflage aus dem Jahre 2007 gibt es ein Vorwort von Dr.Joachim Radkau. Riemschneider setzt voraus, daß jener keine Kenntnis davon hatte, daß Verfasser seinerzeit umfangreiche deutsch-sprachige Informationen, und zwar in den Jahren 1949 bis 1952 der Autorin zur Verfügung gestellt hat (SPECIAL PART A).- Obwohl es inzwischen ein Czernobyl gegeben hat, lobt Radkau ,dass die Autorin in „literarischer Form des SILENT SPRING“ die damals durch Atomwaffenversuche hervorgerufenen Ängste auf die mit Pestiziden verknüpften Risiken übertragen hat. Welch ein Irrtum, derartige Zusammenhänge zu konstruieren! Atomunfälle von der Art Czernobyl enden praktisch nie - in Anbetracht der hohen Halbwertszeiten von radioaktiven Materialien und wenn man bedenkt, wie kurz ein Menschenleben ist. Detailed review in „Pflanzenkrankheiten (Pflanzenpathologie) Pflanzenschutz“ 56 366 (1949); also in Seifen, Fette, Öle, Wachse 74 80 (1948); Natur und Technik 3 no 19, 182 (1949) Chemical Abstracts USDA 1949, 46011; Orion 12, 470 (1949); cf. (1). The author split the lectures at the BUNA (9), LEUNA (10) and KAUSTIK (10) works into two parts at the wish of their respective managements, who wanted not only the latest information on CHEMICAL PEST CONTROL RESEARCH but also critical comment on the subject. 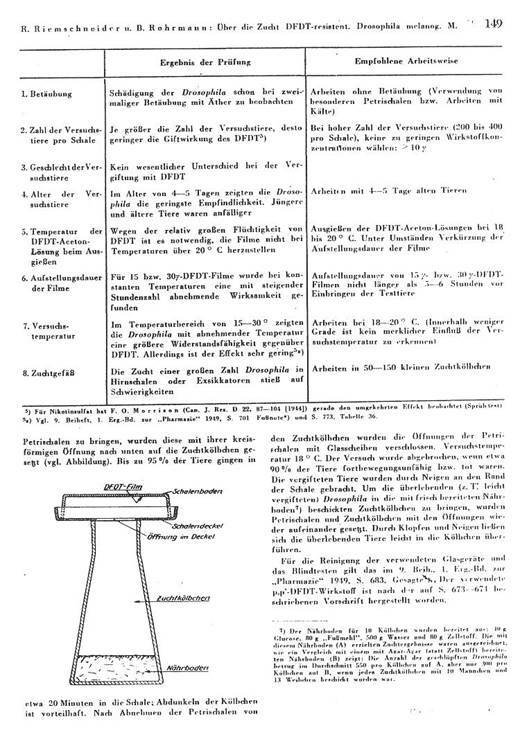 Chief engineer Richter from the LEUNA works had confidentially informed the author that LEUNA and BUNA were at the time were confronted with the decision as to whether they should get involved the field of chlorine chemistry or not – tending more towards “no”. Author had known chief engineer Richter since 1943 as former head of mechanical engineering department at RUHRÖL GmbH, cf PROJ III in (2). Lectures I and II were repeated on 06 and 07 June 51 in colloquiums at Plant Protection Dept of HOECHST at the instigation of Dr F Scherer (director) and the invitation of HOECHST’s management. Publication of the contents of the lecture was deferred so that the scientists from the Plant Protection Dept could check the proposals made and had enough time to study the literature. For the first time, there was talk of a “chemical cudgel” in the discussions, but also that it should not be talked about too much. Neem tree: For centuries the Indians have venerated the neem tree as the “donor of health” that protects people from plant and stored food pests as well as disease carriers. Valuable products can be manufactured from both seeds (→ oil) and leaves (→ aqueous and alcoholic extracts) that according to India’s experience can be used as – for humans non-toxic – insecticides and repellents. Olive oil: Extracts from the large quantities of residues obtaining from the production of olive oil showed considerable fungicidal and some insecticidal activity. Plant parts to be protected against fungicides are sprayed with extracts from olive oil production residues (aqueous, diluted, alcoholized) The Plant Protection Dept at HOECHST did not, however, wish to pursue this avenue. - The author did so in his work 1948-58. Newspaper „Die Welt“ from Nov 7, 2007, p 31. Breeding of the strain was continued in the Crop Protection Department of the MONTECATINI Works, Via Turati, Milan from 1951, as well as in the labs of BOMBRINI, PARODI, DELFINO Company, Rome. The valuable fly material was then handed over during my stay in Milan and Rome in April 1951 for further research. As with DFDT (16a), the experiments with M 410 were begun at the end of 1947 to demonstrate the need to reckon with resistance and draw attention to coming problems and solution (17-23). 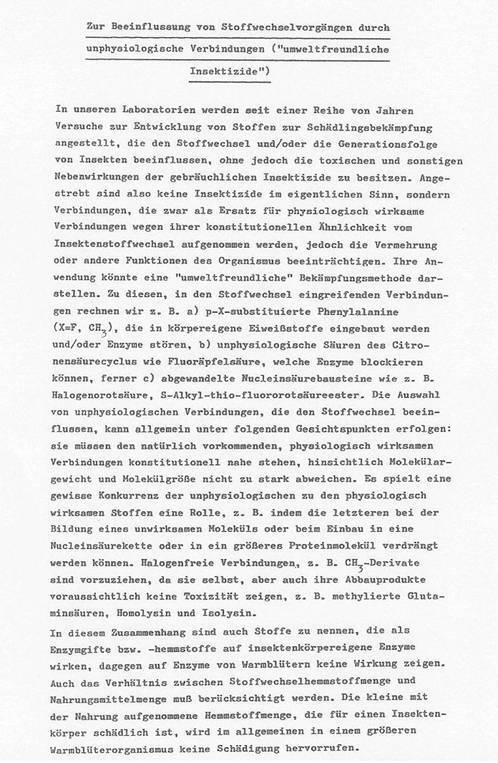 Lecture, given in May 1974 in colloquium in building IV of Central Inst of Biochemistry and Biophysics at Free Univ of Berlin. In the discussion, the author drew attention to his lectures of 29 Jan 48 (8), 11 Feb 48 (9), 16 Nov 50 (11) and 23 Feb 51 (12) on “Controlling pests with chemical agents – consequences for humans, animals and plants – influence of insecticides and daughter products in the food chain – resistance problems” and “Pest control limiting chemical toxicants” and distributed hectographed summaries of the lectures: (9-13). The summaries of the previous lectures had been prepared as the lecturer had reckoned with “attacks” by the Greens. The list of the scientists attending, named at (11), was then also handed out so that it was possible to request more detailed information, also the special editions of the lecture “Dangers and precautions when using modern insecticides”, given by the author in Jan 48 [extracts reproduced in “Arzt und Patient” 63 no 3 (1950), 2 p]. At the end of the long discussions, the author pointed out that he had sent copies of his 1948-51 lectures presented here to Rachel Carson, the nature protection writer, years before her book “Silent Spring” was published - in this context, compare the author’s comments about Ms Carson in SPECIAL PART A). The author recommended several times not to ban DDT and DDD completely to avoid new malaria deaths; he also recommended a middle course under the premise and target “less chemical pest control”. "Critical remarks about SEXUAL STERILISATION OF INSECTS BY IRRADIATION" and "CHEMICAL STERILISATION"
Lecture given again in internal colloquium at Farbwerke HOECHST in Jan 50. Ms secreted till 1970 at the request of the company's management. The 1948 - 86 bulletins on the subject dealt with here are quoted at [(1176 a - n) in (2)] - more on the subject: (19c and Plate 4). Lecture given in Jan 1951 in chemical colloquium of RIEDEL DE HAEN Co, Berlin-Britz (chair: director Dr A Heymons). cf http://www.bwwsociety.org/journal/html/thalidomide.htm , 2004 and PROJ XXI in (2). The most important results were patented by foreign industrial enterprises at the end of the 70s. (19 g) Research report from Faculty of Chemistry, R Riemschneider, Free Univ of Berlin 1978, p 288: in SPECIAL PART D, report in Plate 4. Synopsis 2001, 110 p (secreted); earlier reports (20a, c); cf SPECIAL PART VI 6.1 in (2). Results in SPECIAL PART VI 6.1 in (2). In many experiments conducted 1970-75, documented in the above lab reports, it proved possible to enrich the tripertene factor (repellent for chewing insects) from Azadirachta indica to a product with mp 223-225°C and mol wt 580-600, with the provisional empirical formula C28-30 H35-42 O9-12 . The fungicidal and insecticidal tests with the extracts from residues of olive oil production prepared in Berlin were carried out in Brazil, under the organizational direction of Prof Dr R Wasicky, University of São Paulo. The observed effects of the extracts were considerable and were to be corroborated by further tests. Unfortunately, HOECHST’s management and Plant Protection Department were not cooperative in this case. Prof Wasicky was very interested in advancing the PROJ, but his move to the University of Santa Maria, Rio Grande do Sul, kept him too busy. lecture, given end of August 1964 in English in colloquium of Univ. S. Maria, in Sala de Atos, Edificio sede da USM, S. Maria, RS, Brasil. more details in PROJ XVIII in (2). 2 lectures given in Agricultural College, Hohenheim, in Feb 57 and Mar 61. Lecture given in colloquium of newly founded Inst of BIOCHEMISTRY, Free Univ of Berlin on 01 Sept 62 and repeated in colloquium of Chem Inst, Univ of Vienna. Includes results from [543 d, e in (2)]. Experiments carried out in Brasil, organized from the Dept of Biochemistry FU Berlin in co-operation with Prof. Dr. R. Wasicky, Univ.S.Paulo, and Dr.Pesserl, Curitiba. Ms Dec 50, presented in conference room of RIEDEL DE HAEN Co, Berlin-Britz in Oct 50 - Method desribed in Plate 2 (16). Review: Chem Zbl 1948 II, 344. An abridged version of Bull R 8 was received as ms by the editors of journal Die Pharmazie on 15 Mar 47 but at the authors' request only published a year later in Die Pharmazie 3 115 - 116 (1948).